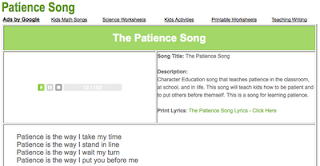 The Patience Song has just been released by the Have Fun Teaching web site. This song is great for teaching kids how to be patient. Use this patience song at school, in the classroom, at home, or in the car. Check out Have Fun Teaching for more Character Education Songs. That's a cool song! I really like the beat of it! Hopefully this will help develop more in the area of character ed. I think I'll try it with my kid, how has this song been working for you?